Many of you will know of the late Abbé Franck Quoëx, who died on this day eleven years ago. Abbé Quoëx was a liturgical scholar and a cleric with a passion for the liturgical arts; of Romanitas as particularly manifest through through the splendour of the baroque. He has left a lasting impact that continues to be seen and his legacy is particularly suited to our purposes here on LAJ. Because of this I wanted to share again this piece that I had translated many years ago so that his legacy might be better known in the English speaking world as well. I am pleased to present it again today, this time on Liturgical Arts Journal. The memorial was originally written by Abbé Brice Meissonnier, FSSP. On Tuesday, January 2nd, 2007, on the Feast of the Holy Name of Jesus, Abbé Franck Quoëx was recalled to God, taken by a relentless cancer. 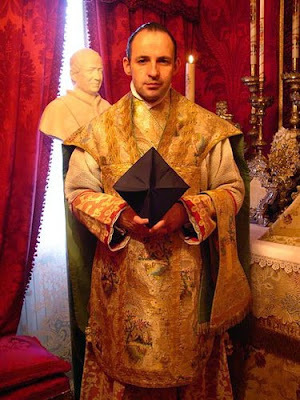 This 39 year old priest, incardinated in the archdiocese of Vaduz (principality of Liechtenstein), was, for those who had the honor to approach him and to know him, a priest of a great refinement and great politeness, noble and discreet, faithful in friendship and of exquisite courtesy. But Abbé Quoëx was especially, and in this he will be sorely missed in the ecclesiastical sciences, a great scholar, an incomparable liturgist and undisputed specialist of the Roman liturgy, its history and its ceremony, a professor sought after and now to be missed. The short life of Abbé Frank Quoëx was centred on the liturgy. Born June 21, 1967, at Bonneville in the Haute-Savoie, into an old Savoyard family, he liked to be defined as Savoyard rather than French, thus showing his dual culture mixing the best of France and Italy. 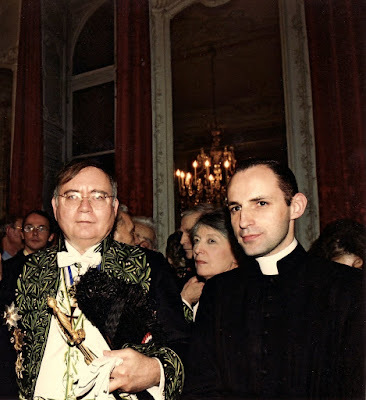 In 1986, he entered the international Seminary of St. Pius X in Ecône. But in 1989, he joined the young Institute of the Christ the King Sovereign Priest, initially in Moissac, France, and then in Gricigliano, Italy. He was soon to become this Institute's iconic Master of Ceremonies and professor of liturgy. 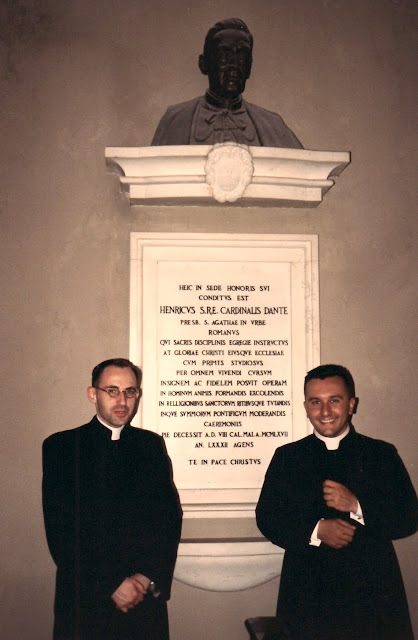 On June 21, 1992, he was ordained a priest in and for the usus antiquior [literally: "le rit tridentin"], by Cardinal Pallazzini. He then started studying theology at the Pontifical University of the Angelicum in Rome, while providing a pastoral ministry in the Eternal City, a city more than anything else dear to his heart, a city that was the passion of his life, a city where he would have loved to die! For Abbé Quoëx was fundamentally and viscerally Roman, in the noblest sense, so much that his friends would often refer to him as "the most Roman of French priests." The memories and friendships he left in the heart of Christendom are a reflection of the love and passion he showed for Rome. 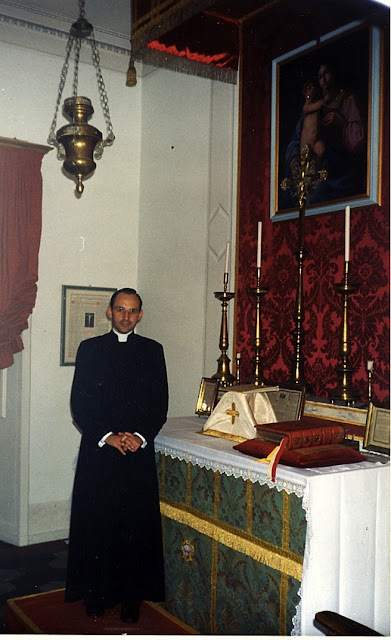 In May 2001, he brilliantly defended at the Angelicum, his doctoral thesis on "The External Acts of Worship in the History of Salvation according to St. Thomas Aquinas." [Les actes extérieurs du culte dans l’histoire du salut, selon St Thomas d’Aquin] This rich and original subject helped him develop his talents as a theologian and historian of worship. The combination of these two facets always characterized his intellectual approach, making him a pupil of the great liturgists of the late nineteenth and twentieth centuries. Among them are the R.P. Gy, O.P., who, in spite of their fundamental divergences, had repeatedly and publicly praised the intelligence, erudition and remarkable quality of the liturgical works of Abbé Quoëx. The two men esteemed each other greatly, and remained in frequent contact until the death of the Dominican. This doctoral thesis, which Abbé Quoëx was preparing for publication by Editions Ad Solem, was noticed at the time by Cardinal Ratzinger, to whom it had been sent. In the last few years, Abbé Quoëx readdressed the subject of his thesis for the purposes of several important articles in journals such as Revue Thomiste ( "Mystagogy of St. Thomas Aquinas: The Expositio Missae of the Summa Theologica" / "St Thomas d’Aquin mystagogue: l’expositio missae de la Somme théologique") or Sedes Sapientiae for which he produced five major articles and reviews. From 2001 onwards, he was increasingly sought after for colloquiums, various scholarly research, or simply for teaching. He was until his illness professor of liturgy at the International Seminary of the Fraternity of St Peter in Wigratzbad, and the Couvent St-Thomas d’Aquin of the FSVF in Chémeré-le-Roi. He had also been appointed a few days before his death, professor at the Pontifical University of the Holy Cross in Rome for the start of 2007. Prof. Bruno Neveu(†), of the Institute of France, and president of the Ecole Pratique des Hautes Etudes, encouraged him to take a degree from the prestigious institution he headed, which requires the study of a subject never before explored. Abbé Quoëx chose to make an analytical catalog of the liturgical manuscripts of the Chapter library of Vercelli (Italy). This work of ambitious scholarship, which he prepared under the direction of Professor Jean-Loup Lemaitre, allowed, for the first time, a classification and study of these liturgical sources highly invaluable for the history of worship. The Ecole will shortly publish the results of this lengthy work. Abbé Quoëx specialized in the history of the Roman liturgy during the High Middle Ages, and especially in the transplantation and adaptation of the liturgy in the Frankish area. In this field, he wrote articles on the history of liturgy, including in the journal Aevum (Università Cattolica del Sacro Cuore, Milan). He also participated in several conferences and scholarly seminars, such as the medieval musicology seminar of the Foundation Ars antica in Genoa, the 3rd International Conference for the Study of Gregorian chant in Subiaco, etc.. His other favourite subject was the papal liturgy. In 2005 he received the congratulations of Pope Benedict XVI, to whom he has sent a major study on this subject. Abbé Quoëx also worked on several occasions with the French CNRS [Centre National de la Recherche Scientifique] in the context of a workgroup on "The Early Shape of the Church and Religious Space in the Middle Ages." [Morphogenèse de l’espace ecclésial et religieux au Moyen Age] He prepared, under the aegis of the CNRS, a remarkable and considerable work: the study of manuscript-diaries of the Masters of Pontifical Ceremonies of the modern era, whose writings ranged from the Renaissance to the nineteenth century; a new and fundamental study of the history of the papal liturgy. 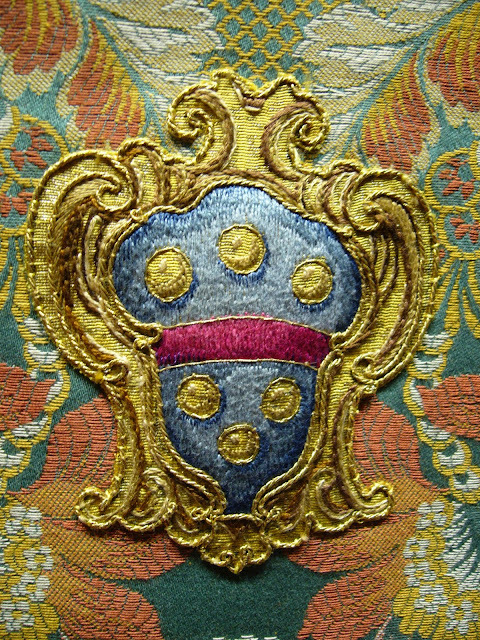 These writings also regulate events related to the concept of temporal sovereignty of the popes, which is of particular importance for the understanding of Baroque ceremonial in general. The aim was to show the influence of the politico-religious ceremonies of the Roman Pontiff on the Courts of European Catholicism from the sixteenth and seventeenth centuries. Abbé Quoëx proposed a systematic study (cataloging, classification, and editing of texts) of these diaries, starting with that of Paride de Grassi (Master of Ceremonies of Julius II in 1520), until the advent of the contemporaries of Urban VIII (1623). Alas, this vital contribution to the history of the liturgy will remain unfinished. But Abbé Quoëx was not a pure intellectual. He was also a great practitioner of the liturgy, and an unparalleled master of ceremonies. It is perhaps this image that he will leave to the general public. A craftsman in the restoration of pontifical ceremonies, which he mastered better than anyone else in the practice, he also knew how to train and inspire a generation of apprentices, who now lead the ceremonies in most traditional institutions. His immense culture never failed, and he knew not only how explain the mystery of the liturgical rites, but also to communicate a love for the ceremonies of the Church. Historian, theologian, doctor of the liturgy, but also a lover of beauty, he was convinced that "the perfect beauty of the liturgy can give a glimpse the supreme beauty of God," as he wrote. Of infallible taste, he did not confuse the beautiful with kitsch, the refined with the pretentious, the sober with the plain. 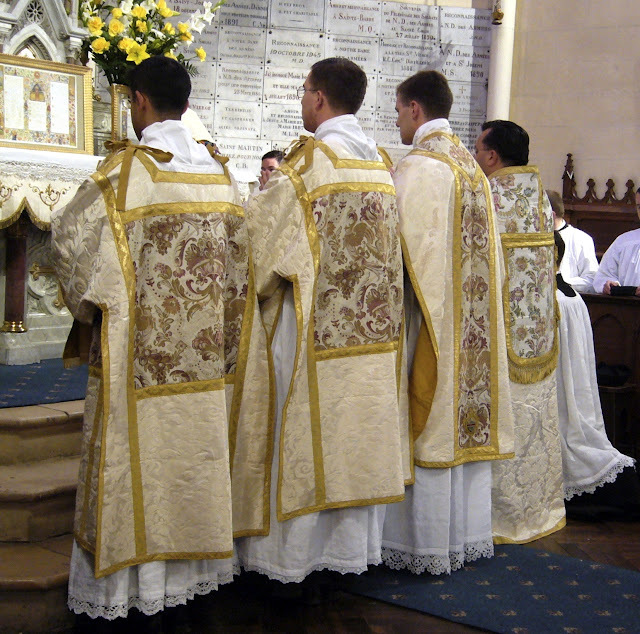 Everything in the liturgy must participate to help us to perceive "the supreme beauty of God." 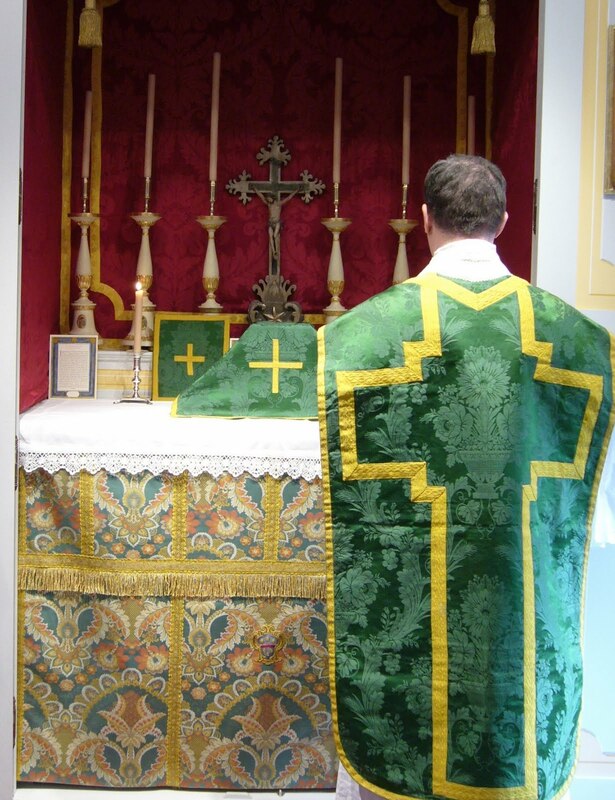 Hence the special care he brought to recover the noblest forms, the most elegant and most beautiful vestments. Tirelessly, through paintings, murals and prints, he began his quest for aesthetic perfection, preferring the period of the Counter-Reformation in Rome. 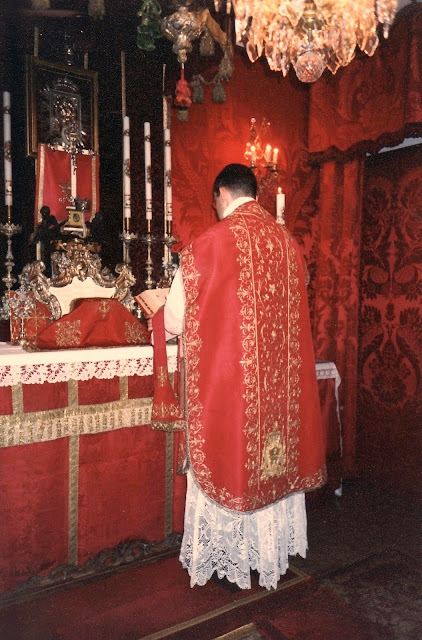 He was the first to commission, with the help of famous vestment maker, Piero Montelli of Verona, vestments, albs, and surplices inspired by this period which he saw as the apogee of Catholic liturgy. His taste for perfection lead him again to design his own altars and candlesticks, commissioning them through the best Italian craftsmen, with the assistance of his friend, the Roman heraldist Maurizio Bettoja. Chapel in Rome. 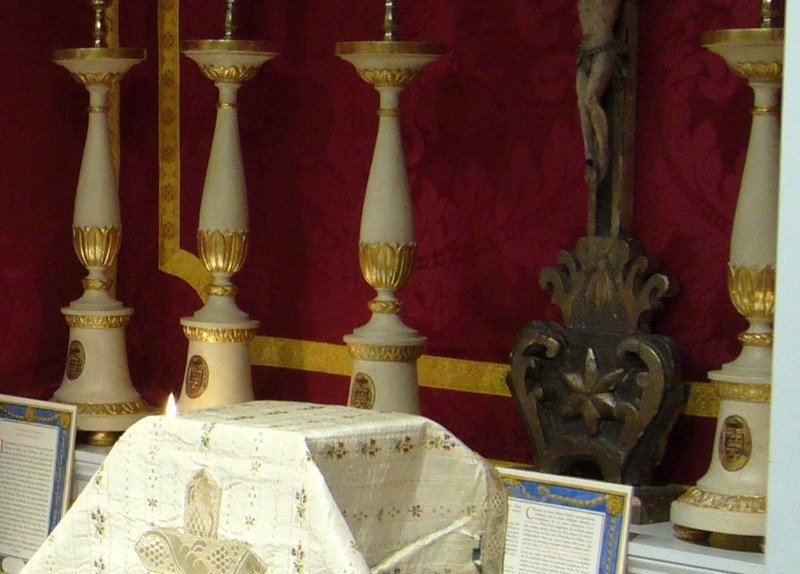 Note the frontal, the cushion for use for the missal, the candlesticks and cross, as well as the textile canopy/tester over the altar and behind leading up to it. Not wishing to keep to himself the fruits of his research, and wishing to participate in his own way in the liturgical revival, Abbé Quoëx had planned to found a "Society for the Study and Promotion of Tradition and the Liturgical Arts." (in French: SEPTAL, Société pour l’étude et la promotion des traditions et des arts liturgiques) The idea, creative, original and exciting, was to bring together specialists in painting, sculpture, architecture, music, heraldry, vestments and ecclesiastical goldsmiths, religious, liturgists, lovers of beauty, philosophers, art historians, liturgical theologians, biblical scholars, and patrologists, all in a deliberately "Tridentine" context. Eager to link research and formation, he planned the publication of booklets which would share the fruits of all this work. As an excellent teacher, he wished the articles to be scholarly, accurate, as yet unpublished, but without being obscurantist. His premature death prevented him from carrying out this ambitious project, but one can hope that his idea would come to fruition one day? In 2005, he founded with some friends and followers, taking up an idea from Prof. Bruno Neveu, the Société Barbier de Montault, which aimed to make known the person, work and spirit of Mgr. Xavier Barbier de Montault (1830-1901). This Roman prelate, archaeologist, liturgist, canonist and heraldist, was in his day an atypical model of an exceptional ecclesiastical erudition. In the French context of strong neo-Gallicanism, Mgr. Barbier de Montault was a keen promoter of the spirit, liturgy and customs of Rome. He left a colossal amount of work, books and articles, so distinguished by a deeply Roman taste and spirituality. Some, as yet unpublished, will soon be published. 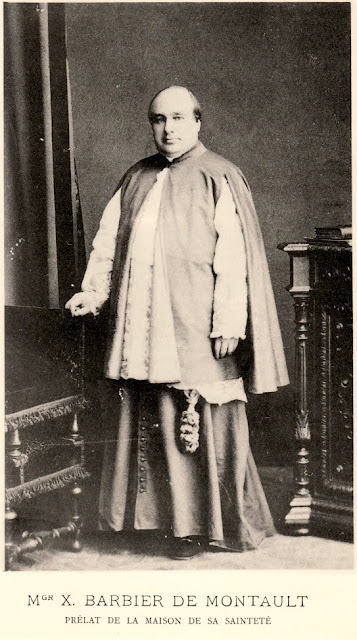 Abbé Quoëx, first president of the Society, was an exemplary disciple of that which Blessed Pius IX called "the most liturgical of archaeologists and the most archaeological of liturgists." A fervent admirer of the Italian poet Cristina Campo (1923-1977), in 2006 Abbé Quoëx translated and presented for publication by Ad Solem, her collection of liturgical poems: "Between two worlds" [Entre deux mondes]. With it she shared a rather "Eastern" vision of the liturgy, seen as celebration and contemplation of the divine mysteries. In the same way he also appreciated her doctrinal vision of the liturgy: "Cristina's struggle is driven by her love of beauty which is not confined only to the aesthetic dimension, more exactly, it underpins the beautiful as the splendor of truth. It supposes the faith in the love and delight of the whole being in Jesus Christ. The liturgy is the supreme beauty, the epitome of poetry, because it is a theophany of the Word made flesh, the radiance of the Divine Poet. That is why this battle can and should become doctrinal, driven not only by a love of what is threatened, but by a love for God's people, eager for these sacred and sublime actions which some wish to deprive him." Finally, how can we not stress that Abbé Quoëx was foremost a priest, a pastor of souls, and a spiritual director. 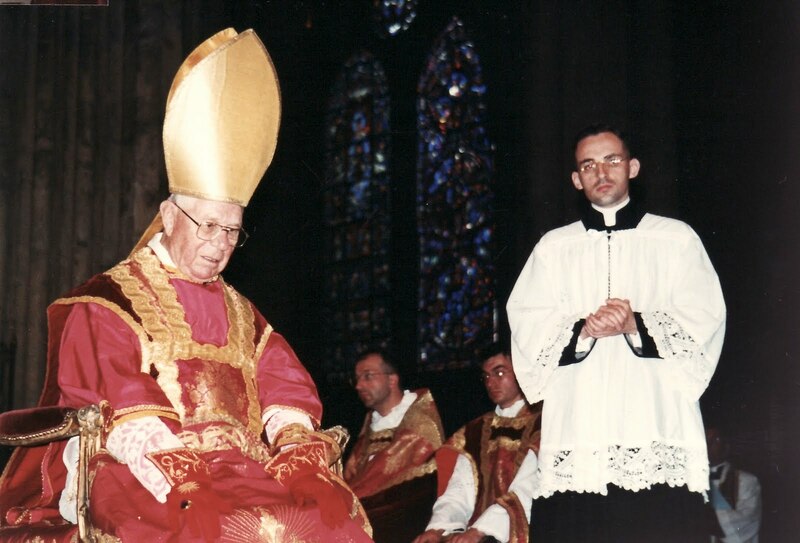 The memory he left in his various places of ministry, Rome, Strasbourg and, since 2004, Geneva, Lausanne and Neuchâtel, proves that his priestly mission was indeed what mattered most. He was able to touch souls through his intelligence and his culture, certainly, but also and especially by his kindness and his delicate, gentle love. And a priest he died, January 2nd, 2007, in the hospital of Aubonne, Switzerland. Let us leave the last word to his friends who watched day and night for a month until his last breath: "Our dear Abbé Quoëx died, dare I say, like a saint! After several months of illness and unrelenting agony that lasted over a month, great suffering, and always a great interior generosity, small delicate words and diverted complaints, apologizing for being a burden. (...) Always he drank prayer like the water with great savour, in which his whole body seemed to burn. He especially liked the prayer of Jesus. Often he would ask, on the morning after a night of suffering: "Help me up, I wish to say Mass ..." We had to explain that he could not rise, and that he would be offering a Mass by suffering with Christ, before being able to offer it soon in Heaven, in the beautiful heavenly liturgy of which we had spoken of so well one Holy Thursday... He passed away quietly this morning, the feast of the Holy Name of Jesus, watched by a close friend who, after singing the hymn Jesu dulcis memoria and reciting Lauds in his hospital room, after having also read a poem by Cristina Campo (Non si può nascere, ma si può morire innocenti) approached supporting him and said: 'Today is the feast of the Holy Name of Jesus. You'll celebrate it up there, the heavenly liturgy is more beautiful than you described. Go ahead, Father, go, the door of heaven is wide open.' He then took breath twice, and left..."
Abbé Frank Quoëx was thirty-nine years old and fifteen years within the priesthood. R.I.P.